inBloom is bringing together states and districts from across the country to improve and align technology systems and teaching resources. There is no reason why each state should have to tackle this challenge alone – together, we have the potential to change the way education works for students on a large scale. How can a student have a personal path within a common system? Thanks to our work and the advocacy of parents and teachers across the city, many parents now know that inBloom, Inc, the Gates-funded organization, is being paid to hold and share student (and teacher) personally-identifiable data with for-profit vendors (read more about inBloom here). However, most people don't know how personal and confidential this data is. InBloom, Inc. has a sample "sandbox" segment on their web page meant "for developers" to show them what data will be made available to them to build their software "tools" around. Under the “medium” data set, we find that student names, addresses, emails, latitude and longitude of their homes and schools, phone numbers, test scores, grades, race, economic status, photos, detailed disciplinary records, special education services and medical conditions are all included. Check out the screen shots below to see more. Name, address, email, student picture, race, economic status, free lunch status, race, language needs and whether the child is in foster care or not. Detailed disciplinary record, including whether the incident was reported to the police and whether there was a weapon involved. This sort of record if leaked out could seriously damage a student's prospects whether or not any arrest or conviction ever occurred. . Whether the student has a developmental delay, is in athletics, or has a medical condition or not. Even specific enough to ask what the child's learning style is. Also collecting teacher data, including name, address, latitude and longitude of teacher's home. Is all this information necessary (or legal) for the government to gather on children and supply to private companies? What does this have to do with education? Where is the parental consent for this information to be gathered and disseminated? Why are teachers home addresses, including latitude and longitude of their home, entered in such a database? What happens if this "sandbox" is a sandbox in which a parent/child doesn't want to be placed? What happens if the "personal path" is indeed not in the "common ground" chosen by the NGA and CCSSO? inBloom would implode because there isn't any way to track the human capital. As we asked yesterday, where is the "Do-Not-Track Common Core Data Act of 2013"? Why aren't politicians concerned about inBloom's invasive data mining disguised as helping children and teachers? The answer to all your questions is contained in Orwell's book "1984." It's All about population control in a nice little socialist system. I'm surprised they don't have a lot of check boxes for the sedatives that will be given to the more creative or unruly kids. You know, the ones who ask a lot of questions like "why?" This is a disaster. I tell everyone to get their kids out of public education and find a what to either home school them or get them in a private school. Public education(socialist indoctrination) has gotten to the point where it can not be trusted anymore, sorry to say. How do I fight this in my daughters school? How is this data collected? She is a sophomore in HS soon to be a junior. She is in the Ferguson Florissant school district. Please sign the petition on this site against CCSS and inform your friends and family about the data to be gathered on their children. We need signatures and support! And please let us know if you need folks to come talk to groups about CCSS. We'll be happy to help. I discovered Common Core by accident when researching huge expenses of our school board. One of the expenses was a company called Infinite Campus. I discovered it to be a student information system that had been set up for the adaptation to Common Core. Infinite Campus' homepage proudly states "Transforming America". If I could count on one hand how many people in NW PA know about CCSS, it would be a stretch. I need help! If I coordinate a speaking event, could someone head this far north? Do you have twitter? Contact @shanevanderhart or go to www.truthinamericaneducation.com and contact him there. The organization will have a list of folks from PA you can work with. Good luck! 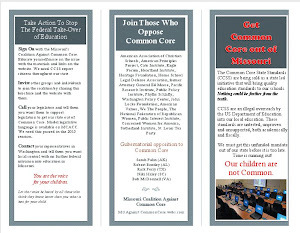 From Pennsylvanians Against Common Core's status. "Since our group, the York912Patriots, learned of Common Core via Glenn Beck we've formed an Education Committee to start working on action items (contacting Governor Corbett, the State Board, the Appropriations Committee, etc.). We also booked Emmett McGroarty who will be speaking at our meeting on April 4th. Right now it looks like this meeting will be televised on PCN (PA Cable Network) so say a prayer that it happens! 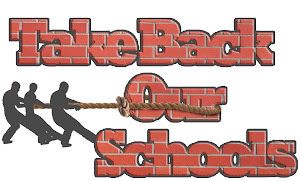 Thousands could see what Common Core is all about if PCN tapes it."